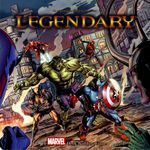 It looks like it has been over a year since a big geeklist of superhero-themed games has been posted. There have been quite a few new superhero titles popping up just in the last year, so here are some of the recent superhero releases. Please comment away and fill in any I've missed and/or any that are coming in the next few months. Excelsior! - The game can be kind of on the easy side, especially after you've played it a couple of times. Apparently both of these issues are addressed in the first expansion, Dark City, which supposedly ramps of the difficulty quite a bit. 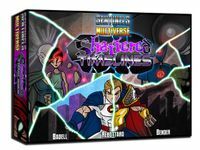 Recently successfully funded on Kickstarter (5/23/13), this is currently a 2 player deckbuilding card duel between hero and villain factions. The first expansion is supposed to add 3 and 4 player support. I was very close to backing this one but held off at the last minute because I felt like I was going a little kickstarter crazy. But I kind of wish I had backed it now. Another Kickstarter project, this time with minis! It's being published by Iello so you know the quality will be high when it is released (supposedly this fall). One player plays the main bad guy and all his henchmen and each other player plays a single hero. Like Sentinels this takes place in it's own unique superhero universe. The game itself seems to be a tactical minuatures combat game with modular tiles and scenarios and goals that play out as you fight your way through the bad guy's base. Designed by Paolo Mori (designer of Libertalia and SDJ nominee Augustus). 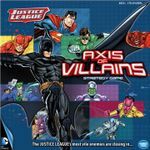 The players are each Batman villains (joker, killer croc, two face, penguin) trying to stake out their turf and the super-tough Batman is controlled by the game system to go around and mess with the players plans. It comes with figures that could double as Heroclix figures which I have to imagine is half the reason for the game's existence - to try to draw in heroclix players. Haven't heard great things about this one unfortunately. This game will always be compared to Marvel Legendary because they came out right around the same time, although it's sort of an unfair comparison because this game is lighter and adversarial rather than cooperative. The theme must shine through in a superhero game and you don't really get a lot of it in this one unfortunately. Hopefully with expansions it can be fleshed out into a worthwhile yin to the yang of the Marvel game. Another kickstarter project! This one was funded in Sept 2012 and available for pickup by backers at Gencon. It will be at retail in Sept apparently. I must say I don't know anything about this one, which is kind of the point of geeklists, right? Expand your horizons and find out about games you missed out on? 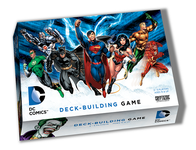 As you build your deck you flesh out the powers of your hero and you and the other players cooperatively fight the minions and villain of that game. 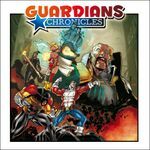 Like Sentinels, Hero Brigade, and Guardians Chronicles, this takes place in a new universe of heroes which these days I almost prefer more than the standard marvel/dc folks. The latest Sentinels expansion, released in 2013. It's always fun to mess around with alternate versions of a universe and it's no exception here. Old enemies are now heroes (Omnitron X) and previously good guys are now bad guys (Iron Legacy). The new villains are cool, the environments are cool - really, if you like Sentinels you know already that you will like this. Originally slated for Oct 2013 it looks like it is now an early 2014 release. 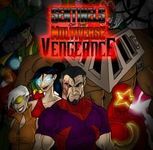 It is a standalone expansion for Sentinels that introduces the villain team of the Vengeful Five led by Baron Blade. New game also in the DC universe. This one is a "defend the castle" type game, but the castle happens to be the Justice League's spacestation HQ, the Watchtower. Four members of the Justice League - Batman, Superman, Flash and Green Lantern. Villains are of two varieties - Arch Enemies (some for each Hero) and Ultra Enemies (very powerful, League level villains). Looks fun, very thematic, but very, very lightweight and dicey. 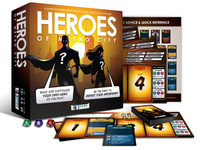 Super hero vs super villain dice building game!